When your running errands or hanging out outside with a baby there’s a great chance you’ll end up dropping and sometimes losing a pacifier or sippy cup or two. Thank goodness there are solutions for us mom’s today! Ah Goo Baby has many great products to keep baby happy and healthy. I received Ah Goo Baby’s Pacifier Clip and Bottle Strap for review. The Pacifier Clip is perfect for attaching a pacifier and clipping it to your child’s clothing to prevent it from getting dropped or lost. I found out early on that these are an absolute necessity if your baby takes a pacifier. The Ah Goo Baby Pacifier Clip has a easy Velcro attachment to hold the pacifier and a sturdy clamp to attach to your child’s clothing, stroller or car seat. It does the job of keeping your little one’s pacifier clean and germ-free while also preventing it from becoming lost. Plus, it’s stylish! The Ah Goo Baby patterns are very modern and chic and come in a variety to choose from. Sippy cups and bottles on the go can be a bit of an issue. They fall out or sometimes thrown out and end up on the dirty floor. The Ah Goo Baby Bottle Strap can be attached to your stroller, car seat, grocery cart or high chair with the Velcro strap and a sippy cup can be attached to the other end with the Velcro strap.It’s adjustable so that it can fit any size sippy cup securely. I really love the Ah Goo Baby line of baby products. They are practical, affordable and stylish too! You can get all their products in a matching pattern so it all coordinates. The fabric is machine washable and BPA-free and has proven to be durable enough to withstand my toddler. Ah Goo Baby products are available at www.ahgoobaby.com. The Pacifier Clip is $7 and The Bottle Strap is $9. One lucky Mommy Digger reader will win an Ah Goo Baby Pacifier Clip and Bottle Strap! To enter, fill out the rafflecopter form below. Ends 7/31 at 11:39PM EST. I like the vintage blue. 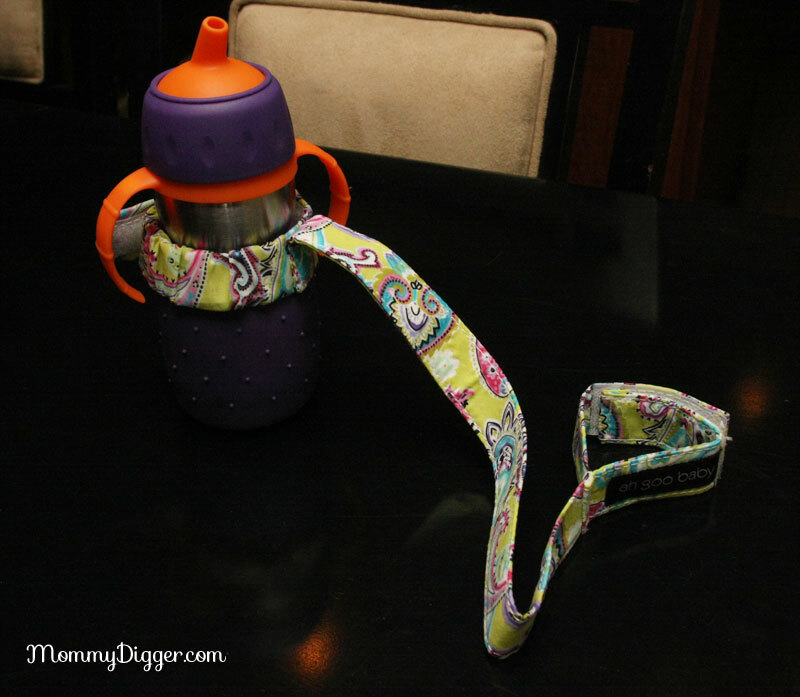 The Goo Baby Pacifier Clip and Bottle Strap are so colorful. I love the audrey pattern. I Love the bloom pattern. I like the morocco print!